Back in the 1980s, when I lived in England, I would sometimes supplement my income and develop my programming skills by writing software for the TI-99/4a Home Computer. 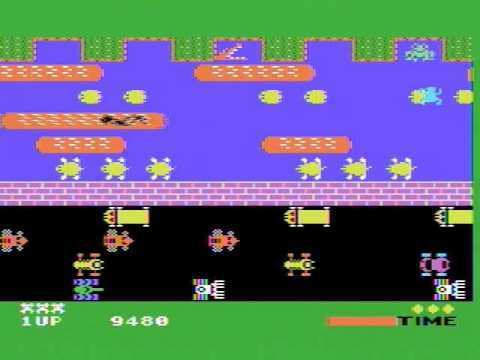 One of the programs that I wrote was a blatant rip-off of the arcade classic, Frogger. Parker Brothers later released an official version of the game, but in some ways mine was much better. Not my version, but mine looked pretty close. the center on mine was a grassy strip. On the TI, Frogger was a very easy game to program. The TI-99/4a's capabilities included 32 moveable sprites, all with automatic motion and collision detection. And in Frogger, most of the objects on the screen aren't really animated... they just move. So there's not a whole lot for the programmer to do other than move the frog. That meant that after coding the basic rules, I had a lot of free memory. So I decided to use it. In my version of the game, instead of simply becoming an "X" or a skull and crossbones or boring instant dead frog upon a collision with a car, the frog's death was gloriously animated. His eyes bulged a little. Blood oozed from his body in an expanding puddle, accompanied by a sound effect: "glug, glug, glug". I worked for the better part of two days just getting that sound effect right. Having completed the game, I had the neighbor's kids play test it for me. And after a long spate of testing, their scores were abysmal. So I watched them play. They weren't even trying to win the game. Instead, they were deliberately sending their kamikaze frogs into the thickest traffic just to watch the poor creatures die. And then they'd do it again, and again. They'd end with a score of zero, and laugh uproariously. Seriously, I could have left all of the game mechanics out of it and just animated dying frogs, and they'd have loved it. This wasn't what I intended. The experience taught me a bit about game design. I should have made the winning condition even more entertaining. So with the few bytes I had remaining, I gave it a very nice animation if you succeeded in saving all of your frogs. Few players ever got that far, because killing the frogs was so damned easy and fun... and to learn about the winning condition you'd have to get past the deaths: something most players just didn't do. The result of saving the frogs was entertaining, too; but it wasn't easy. If I had really wanted people to play the game as I intended, I would have had to change both the reward and the punishment. But I was pretty damned proud of that frog's death, and kept it in. Besides, I'd already gotten all the experience I'd needed from writing the program. A few people still bought it (I only sold a few of anything back then, really), and I imagine they happily whiled away the time killing frogs and gaining nothing. Why do people do self-destructive things? Because that's what people do when they believe that destruction is more entertaining than winning. And if winning is hard -- even if it's rewarding -- they go for easy entertainment, even if it means death. I've seen it happen many times over the years, and each time I think about my version of Frogger.